Using the storyThe Frog Princeas a symbol of traditional awareness of the potential marginality of men in society,Transforming Menproposes that much of patriarchy is a theatrical illusion. Presenting men as more important and powerful than they really are should be seen as a way of controlling them, rather than as a system for dominating women. The author believes that both men and women need to feel that other people are dependent on them. Dench states that women acquire a sense of responsibility through the direct dependence of children, but most men can only come to experience responsibility via women. If women reject the male breadwinning role, then men will never develop the altruistic incentive. 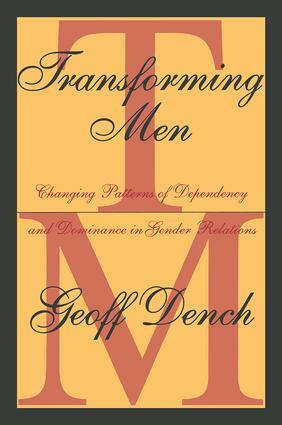 Dench urges that men need to be given a greater stake than women in the public realm in order to be the main family providers and become caring members of society. Dispensing with male privileges and formal positions, the author continues, will simply reveal and revive older and deeper problems, to which patriarchy itself was a historical and sociological solution. Dench does not deny the possibility that if men did behave as feminists have asked or expected, then certainly we would be living in a far better world. However, he asserts that it is too simple to just blame men for the fact that this has not happened; perhaps the real failure lies in feminist approaches and theories. Thus, Dench persuasively argues that feminism may be making the male problem worse, not better by insisting on everything from absolute parity to role reversal. Transforming Mencontains examples of many different feminist viewpoints, including those of Margaret Mead, Betty Friedan, and Camille Paglia. It also uses contemporary cultural instances, such as popular movies, television shows, and books, to emphasize its points. This volume presents an intriguing argument regarding feminism versus a patriarchal society. It will provide stimulating reading for all those interested in the feminist debate.